Greetings! As co-owner of ROW Adventures, I've been sharing life-enriching experiences with our special guests for over 30 years. As a woman, and mother of two, I know you have unique concerns and questions. 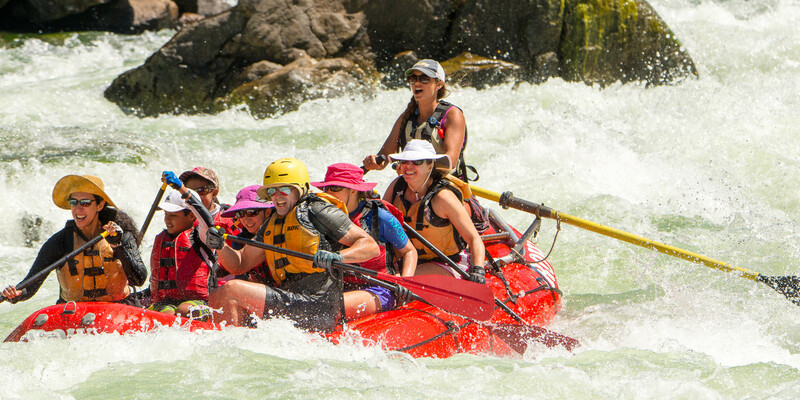 Whether it's one of our whitewater rafting trips, a canoe adventure, kayaking trip, family vacation, exotic escape or spiritual retreat, rest assured that our goal at ROW is to make your journey in nature as comfortable and life-enriching as possible. So many of us live lives filled with demanding days of work, mothering, volunteering and managing a household of activities. You deserve, and need, a vacation that relieves you of these responsibilities and allows you to rejuvenate your body and soul. That's why we offer such a wide variety of options. On our wilderness trips, we bring many of the comforts of home with us. Our luxury camps are set up in advance by your guides. When the group arrives each afternoon, tents are up along with dining tables and chairs. Sun showers provide a cleansing wash. Our kitchen crew creates healthy, delicious meals, clears the table and washes all the dishes. Other trips include accommodations aboard comfortable yachts, or stays in locally-owned, warm-hearted accommodations. Your security is our highest priority. Our attentive, intuitive office staff will help you choose a suitable trip and prepare you with detailed information on what to bring and how to pack. All our adventures begin with a thorough safety orientation. Our guides are well-trained, knowledgeable and experienced professionals who share my concern about your comfort and security. We address sanitary issues as best possible in a wilderness environment. Our portable toilets are placed in their own tent to provide you with privacy. Our hand-wash system with a custom-made foot pump provides running water. Our guide staff includes women to make sure your questions can be addressed by someone who knows and understands your special needs. I've raised my two children on the rivers, lakes and forests of the Northern Rockies and our time in nature has always been the most special time we've spent together. I believe that unless we maintain our connection to, and understanding of, nature, there is little hope for the future of our planet. That's why we developed our "Family Magic" rafting program on Idaho's Salmon River. For over 25 years we've been providing other mothers the same opportunity to take their family into the wilderness without needing to have the skills, special equipment and time required to plan such an adventure on their own. For those not quite ready for camping, we also offer a lodge-based family adventure camp at our River Dance Lodge on the banks of the Clearwater River. You may also find that one of our River Soul Journeys offers the healing tonic you need. These spiritual retreats, offered for women only, or in a co-ed format, combine yoga, journaling and meditation along with the magic of the river environment to allow you to discover your true, powerful and real self. I invite you to call our office. Several of our stellar adventure consultants are mothers themselves, ready to listen and help you choose the perfect vacation. My hope is that your time with ROW will open up doors of discovery, windows to your life's special meaning and, create memories that you will take with you to heaven.